50 The Sponge 2 Qrts Milk 1/2lb yeast 1 [Qrt?] 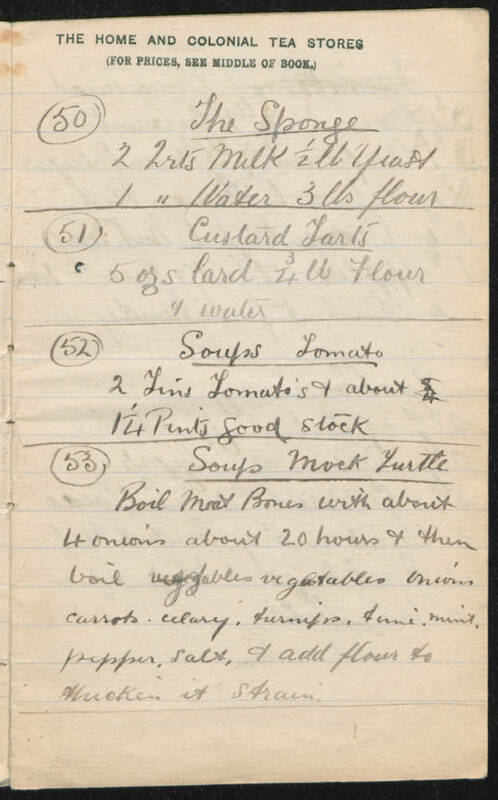 Water 3lbs flour 51 Custard Tarts 5ozs lard 3/4lb Flour & Water 52 Soups Tomato 2 Tins Tomatos & about 1 1/4 Pints good stock 53 Soup Mock Turtle Boil meat Bones with about 4 onions about 20 hours & them boil vegetables onioins carrots, celary, turnip, [time? ], mint, pepper, salt, & add flour to thicken it Strain.